Winter brings amazing weather and lets us bring out all our stylish jackets but unfortunately also brings dryness with it. We've all been using beauty balms on our faces for a while now (that's the full form for the popular BB cream) but Schwarzkopf here has created one for hair! This is a new product from Schwarzkopf’s latest BC Bonacure Hairtherapy range. The combination of winter and chemically straightened colored hair has been making my hair feel like straw at times and Schwarzkopf's Moisture Kick Beauty Balm came to the rescue right in time. I've used the Moisture Kick Spray Conditioner from the same line in the past, and that too is a wonderful product. and a longer lasting healthy looking shine. BC Moisture Kick – rebalances and delivers optimum levels to improve resilience, increase shine and eliminate static to give supple, shiny, moisturized hair full of elasticity and bounce. 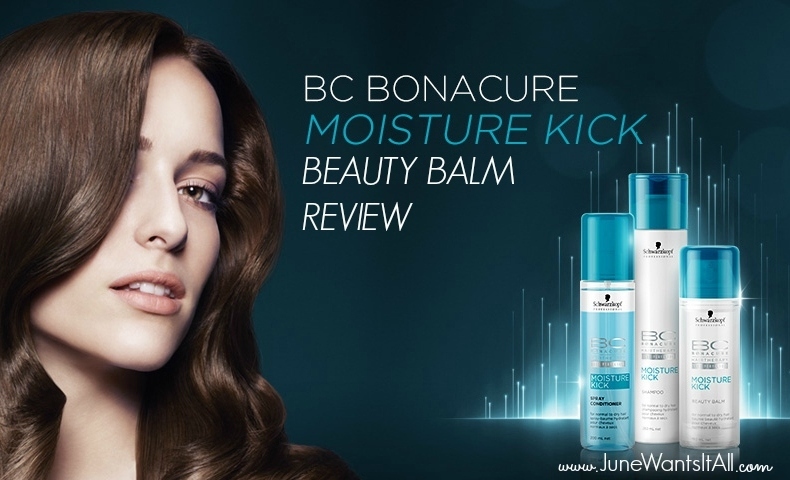 BC Moisture Kick Beauty Balm is a moisturizing care and styling balm that you apply to damp hair while it hydrates it protects and beautifies your hair. Its lightweight and has added heat protection so you can use it before ironing or blow drying your hair. Serums can make your hair greasy and kinda icky but this product leaves hair silky dry and smooth because it doesn't contain silicone. As I mentioned before, I use a bunch of products on my hair so to maintain style and shine, and this gem is one of them. If you're looking for an alternative to serum for smooth and silky hair, give this a shot! Wow! I do love this brand! Interesting this is the first time I heard of this and will like to try it. Moisture is so necessary for the hair. Love this brand! Thanks for the review June! I honestly love this brand and would love to try this range. Thank you for the review, I'll check if I can find it in store. Produto maravilhoso amei a resenha. The hair fear products are very important things for me. Thank you for review, I need to try it. My hair is greasy but I think every type need a moisture from time to time. Nice product, June! I'll give it a try if I happen yo see it! You're so pretty, I love your blog. I'm not sure it is sold in Italy. It's a pity, I'm going to look for it. This is a great brand, I hope this is sold in The Netherlands. I really want to try this! I haven't tried this product, but this brand is amazing. I love serums, this sounds like a winner! Lovely review, these products sound really great! Thanks for sharing them June! cool review it sounds like a nice product!! Btw, now I'm your new follower. Great product! I received a few hair products recently, so I will be putting them to test, will see what happens. Watch out for the review!